The Key lime (Citrus aurantiifolia) is a citrus species with an oval fruit; that is yellow when ripe but usually picked green commercially. It is smaller and more acidic, with a stronger aroma than the Persian lime (Citrus × latifolia). 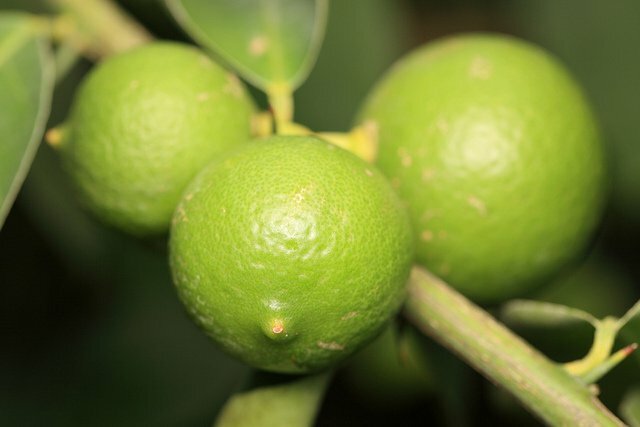 Key limes are native to Southeast Asia and are grown in the United States, Mexico, Central America and South America. 1. Key limes can help individuals fight infections. One fluid ounce of lime juice contains 14 percent of the vitamin C daily requirements. Vitamin C is an effective natural water-soluble antioxidant that helps the body develop resistance against infectious agents and eliminates cancer-causing free radicals in the body. 2. Key limes can help slow down aging. Sufficient vitamin C intake does not only improve the immune system, but it can also create and maintain collagen, an essential protein found in hair and skin. Collagen is the most abundant protein in mammals, making up from 25% to 35% of the whole-body protein content. 3. Key limes can help individuals with type 2 diabetes. According to the American Diabetes Association, limes and other citrus fruits can assist people with type 2 diabetes due to the high levels of soluble fiber to help regulate the body’s absorption of sugar into the bloodstream, and reduce the frequency of blood sugar spikes that are a serious risk to diabetic patients. 4. Key limes can fight against cardiovascular disease. Soluble fiber does not only help individuals with diabetes balance out their blood sugar levels. Soluble fiber also lowers blood pressure and eliminates the presence of low-density lipoprotein cholesterol (“bad” cholesterol). Moreover, soluble fiber can decrease the rate of inflammation of the blood vessels, which is a known preventative measure against heart disease, heart attacks, and strokes. 5. Key limes can help enhance the digestion. Key limes possess a considerable amount of fiber. Fiber stimulates peristaltic motion and increased secretion of gastric juices, which eases digestion, prevents conditions like constipation, and protects the body from more serious conditions like colorectal cancer. 6. Key limes can fight certain types of bacteria. Lime juice and other citrus products have been found to kill Vibrio cholera bacteria and act as a biocide. 7. Key limes can fight against peptic ulcers. Peptic ulcers are distinct breaches in the linings of the stomach or the first part of the small intestine, resulting in acid and pepsin in the lumen. This can be quite painful. Also, to vitamin-C, key limes contain antioxidant compounds called flavonoids (limonin glucoside), which have anti-carcinogenic, antibiotic, and detoxifying properties that stimulate the healing process of peptic ulcers. Silalahi, J. (2002). Anticancer and health protective properties of citrus fruit components. Asia Pacific Journal of Clinical Nutrition, 11(1), 79-84. Pietinen, P., Rimm, E. B., Korhonen, P., Hartman, A. M., Willett, W. C., Albanes, D., & Virtamo, J. (1996). Intake of dietary fiber and risk of coronary heart disease in a cohort of Finnish men. Circulation, 94(11), 2720-2727. Rodrigues, A., Sandström, A., Cá, T., Steinsland, H., Jensen, H., & Aaby, P. (2000). Protection from cholera by adding lime juice to food–results from community and laboratory studies in Guinea‐Bissau, West Africa. Tropical Medicine & International Health, 5(6), 418-422. Terry, P., Giovannucci, E., Michels, K. B., Bergkvist, L., Hansen, H., Holmberg, L., & Wolk, A. (2001). Fruit, vegetables, dietary fiber, and risk of colorectal cancer. Journal of the National Cancer Institute, 93(7), 525-533. Peters, E. M., Goetzsche, J. M., Grobbelaar, B., & Noakes, T. D. (1993). Vitamin C supplementation reduces the incidence of postrace symptoms of upper-respiratory-tract infection in ultramarathon runners. The American journal of clinical nutrition, 57(2), 170-174. Khaw, K. T., & Woodhouse, P. (1995). Interrelation of vitamin C, infection, haemostatic factors, and cardiovascular disease. Bmj, 310(6994), 1559-1563.